The Holy Trinity Ukrainian Greek Orthodox Church (artifact ID WDM-1973-NB-13900) at the WDM North Battleford dates to as early as 1909, when early Ukrainian settlers to the Hafford area of Saskatchewan pulled logs from Little Shell Lake to build the foundation of the church. Organized by Wasyl Pysklivets, this group worked through the winter of 1909-10 to construct the church. By Fall 1910, the church was completed, and the first Holy Divine Liturgy was celebrated. However, the interior of the church was not completed until 1917. The building of a Ukrainian church was a community effort. The land for the church was donated by Wasyl Pysklivets and Dmytro Smetanuik. The primary carpenters who worked on the church were the Kutziks, a father-son duo. The logs were trimmed by Mike Bezmutko and Mike Kotelko, and the dome was built by John Gabrysh. The cross was made by Michael Lazarowich. The first bell for the church was donated by Mrs. Parasky Lazarowich in 1912 after the death of her husband, Nykola. Congregants would walk as far as four miles each way to attend services in the Holy Trinity Church, and most stood through the whole service, as pews were only positioned along the walls for young children and the elderly. Around 1917, shortly after the completion of the interior of the church, the extension at the front of the church was added along with the choir loft. A vestry off the nave was also added to the church at a later date. In about 1937, the linoleum still visible in the church to this day was added, ordered from the Eaton’s catalogue. Photo Credit: WDM-1973-NB-13900, Inside the Holy Trinity Ukrainian Greek Orthodox Church at the WDM North Battleford. In 1968, the church was closed and moved to its present-day location at the WDM North Battleford, placed facing the same direction it had faced in its original location. In 1969, furniture was brought to the church by the congregation to decorate it for display. Holy Trinity Ukrainian Greek Orthodox Church can still be seen at the WDM North Battleford. Though the church was built in 1909-10, there was no formal organization for Ukrainian Greek Orthodox churches in Canada until 1918. In July 1918, a group of lay Catholics from Manitoba, Saskatchewan and Alberta split from the Ukrainian Greek Catholic Church and came together in Saskatoon to create a Ukrainian Orthodox Brotherhood with the goal of organizing a Ukrainian Greek Orthodox Church of Canada. Prior to this, followers of the Ukrainian Orthodox tradition would often attend Russian Orthodox churches, or would be assimilated into the Roman Catholic church, but they desired a more Ukrainian style of worship. The group contacted an Archbishop, who at first accepted the position as head of the Ukrainian Greek Orthodox Church of Canada, but later backed out. Despite the lack of official representation, the congregation went ahead and the first Sobor (council or assembly) occurred on December 28, 1918, also in Saskatoon. 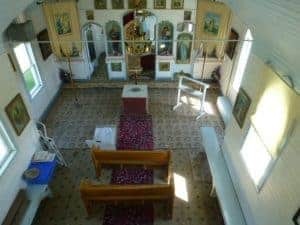 The sight of Ukrainian churches – Orthodox or Catholic – in the Canadian prairies is not unusual to this day. These churches, with their distinctive architecture, are spread across the prairies, a testament to the number of early Ukrainian newcomers to Canada. About 62% of Ukrainian immigrants to Canada before the First World War settled in the Prairies. Though now Ukrainian identity is strong amongst newcomers and descendants of these early immigrants, at the time, few of these immigrants would have thought of themselves as Ukrainian, as Ukraine did not yet exist as a country. 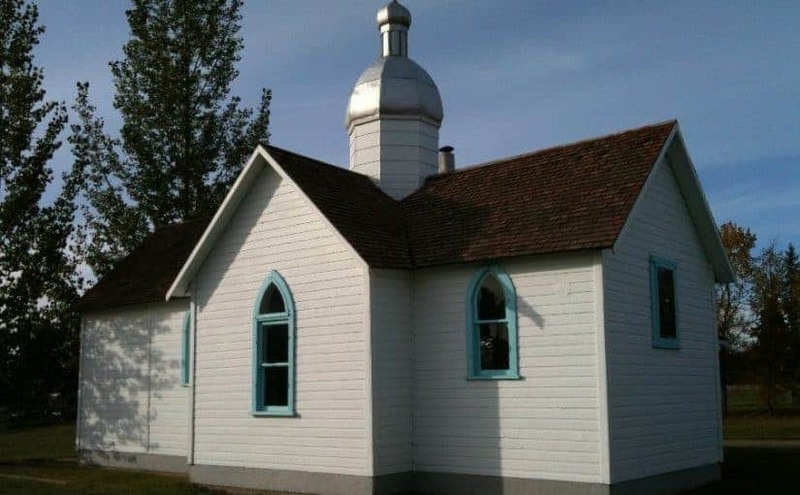 In the late 19th and early 20th centuries, Ukrainian immigrants built their churches significantly smaller than those in the old country, due in large part to a sparsely-populated Canadian prairie. Many congregations held only a few families, as it was virtually impossible to travel far to attend church on a weekly basis, especially in the harsh prairie winters. Churches were built by communities, with people donating time, supplies and decorations to their construction and maintenance. Most churches were built out of wood and were decorated with icons brought by families from their homelands. Many icons in Ukrainian Orthodox Churches were in the Western European tradition because they were easier to access in Canada than Eastern European ones. After the First World War, many Ukrainians moved from farms into Canadian cities, leading to the development of larger, urban churches. It was in this environment that the Ukrainian Greek Orthodox Church of Canada officially formed in 1918. In 1990, the organization simplified their name to the Ukrainian Orthodox Church of Canada. Today, the Ukrainian Orthodox Church of Canada has 140,000 parishioners in over 270 communities across Canada. In 2018, the Ukrainian Orthodox Church of Canada celebrated their centennial. Very Rev. Archpriest Taras Makowsky of Holy Trinity Ukrainian Orthodox Cathedral in Saskatoon spoke to the WDM about the early experiences of Ukrainian settlers and the recent centennial celebrations. He explained that the hardship faced by many of these early settlers made their faith stronger. Physical needs were always met first by building a house for shelter, but spiritual needs were a close second in significance; as soon as shelter was built, construction would begin on churches. “Humble beginnings, humble churches, humble homes,” he said of the lifestyles of the early Ukrainians in Canada. The celebrations were “spectacular,” according to Very Rev. Archpriest Makowsky. The celebrations were about surviving hardship and working for renewal in a more secular time when church attendance is declining. The celebrations were an opportunity to not only look back at the past century, but also to look ahead to what the next hundred years will bring. To Very Rev. Archpriest Makowsky, one important aspect of the celebrations was that they brought the opportunity to teach about the Ukrainian Orthodox faith and culture to other Canadians. The Ukrainian Orthodox Church of Canada’s website can be visited here. The website for the centennial celebrations can be visited here. The Facebook page for the centennial celebrations can be visited here. The Holy Trinity Ukrainian Greek Orthodox Church (WDM-1973-NB-13900) can be visited seasonally at the Heritage Village at the WDM North Battleford. With thanks to Very Rev. Archpriest Taras Makowsky (Ukrainian Orthodox Holy Trinity Cathedral, Saskatoon), Dr. Roman Yereniuk (Acting Director of the Centre for Ukrainian Canadian Studies, University of Manitoba), Lesia M. Skyba (Communications Chair of National Jubilee Committee UOCC), and Gene Zwozdesky (Chair of National Jubilee Committee UOCC). Interview by Kaiti Hannah, WDM, with Very Rev. Archpriest Father Taras Makowsky of Holy Trinity Ukrainian Orthodox Cathedral, Saskatoon. Oct 4, 2018.